This 3-Ingredient Pesto Goat Cheese Dip is the easiest make-ahead appetizer (or snack) ever! 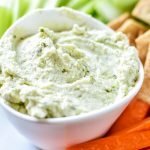 Pairs perfectly with veggie sticks, crackers, on burgers, pizza, and comes together in less than 5 minutes! Add all ingredients to a small bowl and mix to combine. Serve immediately or store in the fridge in an air tight container for up to 4 days. Serve with crackers, veggies or on burgers and sandwiches. This recipe is easy to double if you’re making it as an appetizer for more than 4 or 5 people. Nutrition information estimated with My Fitness Pal.